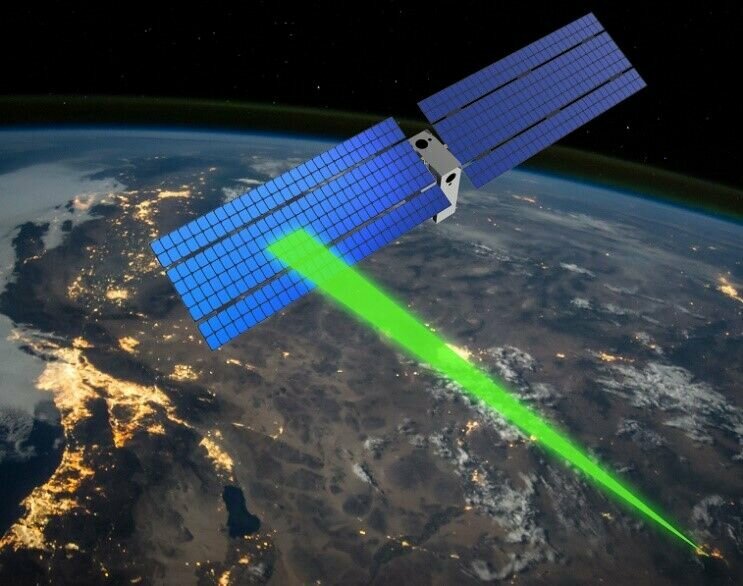 PR image of lasers beamed to spacecraft to perform command and control. Credit: Kalita et al. Swarms of small spacecraft could have a variety of interesting applications, particularly in terms of Earth observation, global positioning and communications. Compared to large spacecraft, small spacecraft provide greater apertures, allowing for better observation of both ground and space targets. Despite their remarkable advantages, effectively operating a large number of spacecraft at once has so far proved to be very challenging. Existing methods typically rely on the work of numerous ground operators, which can be expensive, thus preventing the technology from scaling up. A team of researchers at the University of Arizona has recently developed a new method to coordinate and control spacecraft swarms, which could be easier to implement on a large scale. 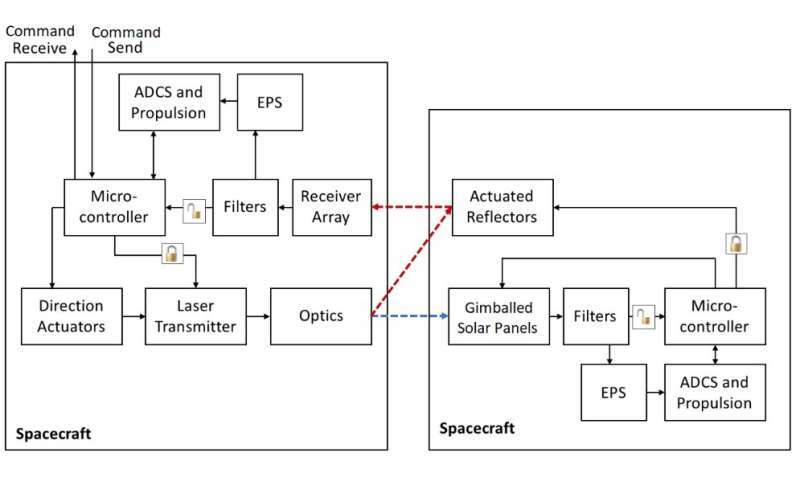 Their approach, outlined in a paper pre-published on arXiv, uses laser beams to organize and manage a large swarm of spacecraft. "We have been researching ways to control swarms and large number of robots/UAVs/spacecraft with very few humans in the loop for more than 10 years," the researchers who carried out the study told TechXplore, via e-mail. "Some of our techniques are entirely autonomous with no humans in the loop, in other scenarios we have humans and robots coexist." In their previous work, the researchers tried to develop intuitive approaches to efficiently control from 10 to thousands of robots. They wanted these methods to be intuitive as this would simplify the training of operators, ultimately reducing their stress levels, particularly during crunch time. 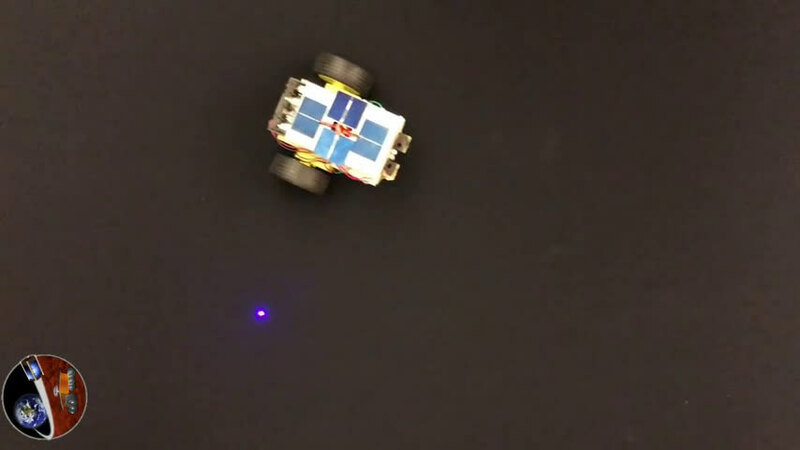 Video demonstration of laser gestures used to control a wheeled robot in the laboratory. "Our idea was inspired by the role of a conductor in the orchestra," the researchers explained. "This one person has the task of coordinating the efforts of many musicians. We think that the analogy for controlling many musicians at a time fits well with controlling many spacecrafts/UAVs/UGVs etc. We hence looked for physical ways in which one can operate much like conductor in an orchestra to control spacecraft. Having a wand was not possible, but using laser beams was definitely credible." 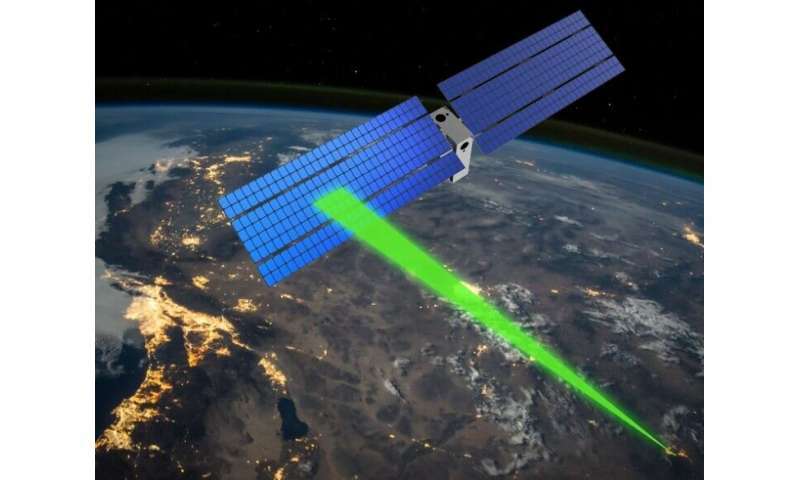 The technology developed by the researchers can sense laser beams on a spacecraft, using solar panels as sensing devices. A solar panel that generates electricity under the sun can also independently sense laser light. Solar panels happen to take up the largest surface area on space satellites, hence they could be the ideal sensing devices for spacecraft. The researchers observed that solar panels can be divided into little squares, resembling pixels on a monitor, which can be used to sense laser light. The laser light hitting the solar panel in different places could result in different commands, with the panel becoming almost like a touchscreen on a smartphone. As a backup, the researchers have also strategically placed digital cameras on the spacecraft, to detect the laser movement in space. Picture of the laser gesture control architecture. Note padlocks indicate encryption to secure decoding/coding of messages. Credit: Kalita et al. Their approach uses laser beams directed from the ground or from a command and control spacecraft to organize and manage a large swarm. Every satellite in the swarm would have a 'smart skin', which includes solar panels, power and control circuitry, and an embedded secondary propulsion unit. The laser beams would interact with the solar panels on individual members of the swarm, allowing an operator to select a 'leader' among the group of spacecraft and set parameters for formation-flight. "In a sense, our technology looks like a scene out of the book/movie Ender's Game, where you have a few operators control hundreds to thousands of spacecraft and robots," the researchers said. "With this technology in place, it is possible to move around the laser light on a solar panel and for the panel to sense that moving signal." 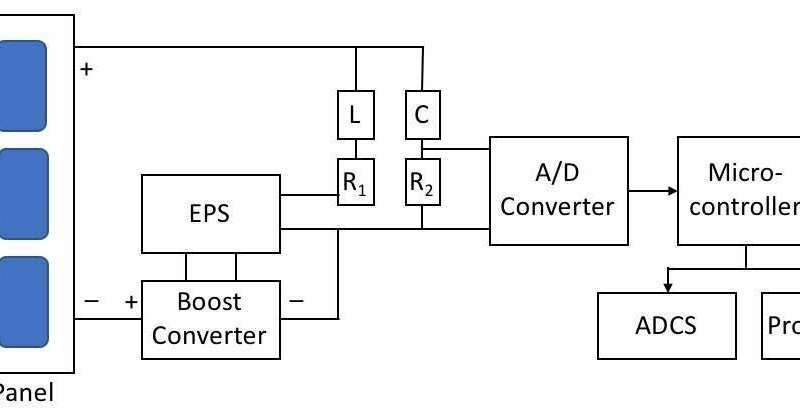 Example of gestures commands applied to a spacecraft solar panel. Credit: Kalita et al. The interface devised by the researchers is entirely based on gestures and hand movements, hence it does not require joysticks or extensive coding. 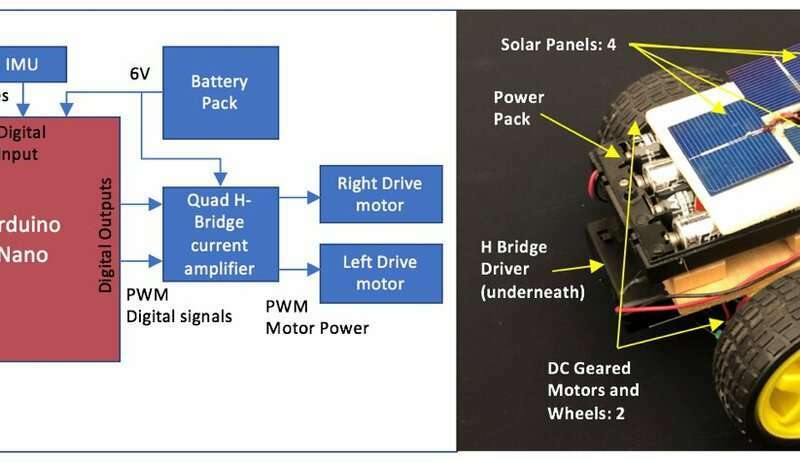 Using their technology, an operator would be able to pass on a message to the spacecraft simply by 'drawing' a particular sign or gesture on the solar panel. "Our approach can be made to be intuitive," the researchers explained. "For instance, if you were to select a spacecraft using this laser light, you simply draw a quick circle on the solar panels using the laser. You can hence have an alphabet of gestures and commands to do all sorts of basic commands and control of a swarm. You can decide on a leader spacecraft and on spacecraft that are part of the group, separating them into one or more groups. You can draw a trajectory/path and have the entire group of spacecraft follow that path, and so on." Most existing methods for the control of spacecraft swarms entail the use of two terminals, one for operators and one for the spacecraft, which can also be controlled using a joystick. Commands are typically given using lines or sets of instructions and this makes it easier for operators to make mistakes. Sending the wrong instructions to spacecraft can have catastrophic consequences, potentially ending a mission and causing millions or billions in losses. The gesture-based approach devised by the researchers could simplify the control of spacecraft swarms, preventing mistakes and command-related confusion. "Controlling fleets/swarms of spacecraft is challenging, as you are working in 3-dimensions, in micro-gravity," the researchers said. "There is no up, down, etc. in space. Our approach for controlling many spacecraft transcends such problems, sparing human operators from having to picture things and instead letting them act out such actions. It is so intuitive that the main concern raised was that hackers and nefarious individuals could learn the same gestures and take control of a fleet of spacecraft. Nonetheless, in our approach security is not an afterthought, it is at the foundation of the system." Smart skin architecture to permit solar panels to decode laser gesture and transfer power etc. Credit: Kalita et al. When developing their system, the researchers prioritised its security. For instance, the laser signals themselves can be encoded and constantly pass a modulated password string. This means that although another operator might be able to see the gestures involved in the operation, they would require access codes to command other spacecraft. Operators handling another swarm of spacecraft nearby might need to see indications of command gestures, as this would help to coordinate swarm to swarm interactions. The approach devised by the researchers allows nearby operators to view these gestures, but prevents them from hacking into the system and controlling other swarms. For missions that require greater security, the signals can also be encoded further, entirely preventing others from figuring out the commands. 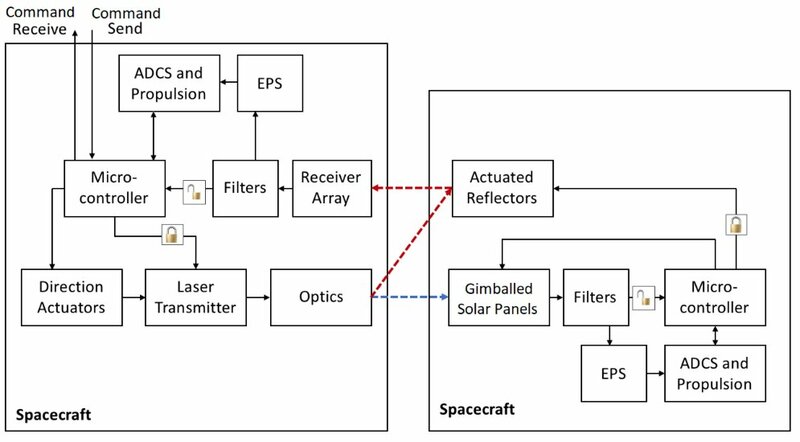 "All in all, the approach allows for a sliding scale of transparency when commanding fleets or swarms of spacecraft," the researchers said. "In some cases, it is important for others around to see what is happening and being cognizant of the gesture commands being executed for the sake of safety, while in other cases it needs to be completely secure and hidden away." The approach devised by the researchers could also be applied to other robotic swarms, such as groups of unmanned aerial vehicles (UAVs), unmanned ground vehicles (UGVs) and underwater vehicles. Currently, the team is working on interactive lab demonstrations of the technology using ground robots. "We are hoping to show the technology in action and for people to have a better appreciation of what has been theorized," the researchers said. "With these ground robot demonstrations, we are constantly on the look-out for sponsors and potential customers." Overview of the laboratory robot. Credit: Kalita et al. In the future, the researchers hope to further advance their approach so that it can be used in specific settings, for instance for military, space traffic management and safety & rescue applications. They have also recently published a follow-up paper, outlining their plans to demonstrate the technology in space. "Our big plans going forward are to demonstrate the technology in space," the researchers said. "We have collaborators such as Prof. Vishnu Reddy who can help us monitor single or multiple swarms of spacecraft using state-of-the-art telescopes from the ground. We could also mount these lasers to work in concert, using telescopes to control the spacecraft."